I have connected the blog to a Facebook page finally. I haven’t finished editing the page and won’t be tonight but I got it done. I’m having issues with Twitter and many issues with Tumblr. One step at a time. Find us in Facebook under the page name Chocolate Milk Cows (or click the link). I called the vet as soon as thier office had opened this morning. I had an appointment booked for the afternoon (was almost late as well). My poor girl has a yeast infection in her ear, with a ten day course of action. The good is she loves seeing her doctor and we quickly went over her over all health too. She did piddle though while she was sitting in the room, I think it happened either when he did the swab test or when the cleaner was first but in. It’s a vets office but I was still embarrassed ha-ha. She’s never done that before but I imagine her ear canal is very sensitive right now. I am still shocked how in less than seven days it had gotten so bad. It was clean and smelt fine last Sunday before I wiped them out. Oh well I knew this was going to happen at least once in her life time. Plus the dogs have thier dewormers now. It is late Thursday (May 26) as I am starting this post. I was checking her ears as I wipe them out on the weekends. Well it looks like she has an infection in one of her ears. We immediately came in to the house and I found the ear wipes. I quickly cleaned the normal looking ear and moved onto her other. She did not seem to be to interested in having me touch her ear (I can understand that). Once I moved to gently wiping the canal area she moved in towards my hand. I kept wiping with new cloths until they came out nearly clean. She did keep shaking her head after. So, I gave her a gently massage and pinned her ear up. Now she is laying in her regular corner. Morning can not come fast enough. I will be calling the vets office as soon as they open to see if there is anything I can grab in town. I will not be in the vet’s area until Tuesday when I have my doctors appointment. This also means I cannot bring her with me either. They have always been great at helping me decide whether or not the dogs actually need to come in (sometimes I do overreacted but better to be safe than sorry). This is her first ear problem and I feel so bad. Anytime anything happens to the dogs I feel at a complete loss. I am constantly reassured that everything has been normal and I cannot prevent everything. That’s not how I feel though. 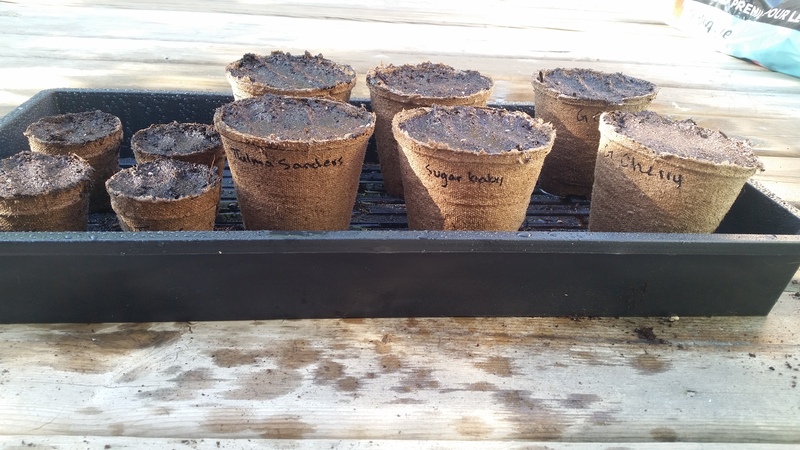 Last week I had put up a post on how I was going to do a container garden series this year. Even more exciting since I will be doing it from beginning to end; instead of just pieces here and there for other people. So here it goes! Now I do not have everything, I still have some seeds I need to purchase and pots to order. Below is a photo of what my ‘not a waste of time or money’ project looks like so far. Now I really tried to put the names on the picture through various photo editors but they all kept crashing at the save point. So, I gave up. Starting from the beginning, I borrowed the tray from Mom (I am the first one to use it :D) plus a clear plastic dome top. I am using Jiffy Peat Pots and Schultz Seed Starter. I opted for Shultz because I do use their plant food which I quite like. Those were purchased at Canadian Tire. Now for the plants. Starting from left to right. I will be purchasing four more varieties of seeds from Edible Antiques again. I was very pleased with service I had received. While I did not have any issues I did 100% feel like I would get results if there had been a problem. I will hopefully be doing (pending approval) a full review with the new purchase. Right now there really is not much to show. I planted two of the last three in case one does not come out healthy. I will be planting six to eight bean plants which made four seem like a safe number. Another four will be started after these ones get put in their container. I will stop this here. I also want to note I will add other pictures to this post sometime in the next couple days. It is late and I wanted to get this done. Fingers crossed everything turns out good! **Pumpkin Moon Farms were purchased by another company since I have order from them. It does seem that the purchasing company was already established. I however have not and will not be ordering from them this year. There is a possibility in the future as I would like to continue purchasing heirloom seeds with in Canada. If you do have any experience with the new owning company I would love to hear about your experience. I am doing a container garden this year. I do the know the basics of plants but I have never done my own garden from seedling to harvest. I have helped with everything else though. The reason I am talking about this is because I have decided that it would a great series for this summer. Plus you get to read and see all of my mistakes ha-ha. This is not going to be a full introductory post mind you. I do have all of my vegetable plants figured out. All of which are heirloom seeds purchased from two different nurseries. I will talk about those more in the official first post. I also have a few that I still need to order. I may change my mind but I really got myself excited for them. I also need to order my containers but I have a couple weeks for that still. By the time this goes up I will have grabbed some containers from my mothers but those will be for flowers. I am quite interested to see how things will turn out. Plus I am sure the deck will turn out…probably kind of tacky. Galaxy will enjoy it though, she does love smelling new plants and flowers. Bullet will be less interested until the vegetables are ready to eat.